Google updated the Android distribution numbers while we were headed home from NYC yesterday, and wouldn’t you know it, Marshmallow continues to climb. Up from last month’s 13.3%, Android 6.0 now sits at 15.2%, a huge increase of over 1%. That might not sound big, but when we’re talking about millions and millions of Android devices, it’s quite significant. 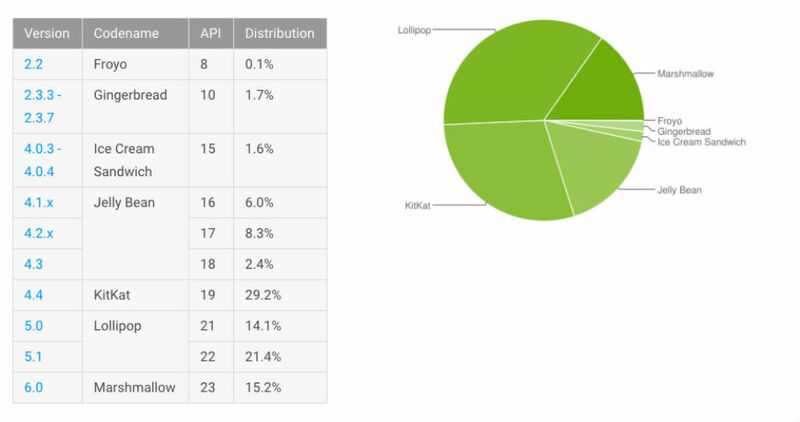 As for the rest of the numbers, Lollipop now sits at 35.5% (a slight increase over last month), KitKat at 29.2%, Jelly Bean at 16.7%, Ice Cream Sandwich at 1.6%, Gingerbread at 1.7%, and Froyo continues to live at 0.1%. Besides the light growth to Lollipop, all numbers continue to go down.